Isobase (IsoRank PPI Network Alignment Based Ortholog Database) is a database of functionally related orthologs, which we term "isologs", developed from the multiple alignment of five major eukaryotic PPI networks, as computed by the global network alignment tools IsoRank & IsoRankN - the "iso-" being motivated by the connection of our work to graph isomorphism. Isologs are proteins that perform functionally equivalent roles in different species. By emphasizing both sequence similarity and functional similarity, isologs are intended to address some of the shortcomings of traditional sequence-only orthology-prediction approaches. How to use Isobase: You can bulk-download all isologs across multiple species, and search for orthologs based on a constituent gene id/name or keyword. A detailed tutorial is available here. Predictions as a result of combining both protein-protein and genetic interactions in the Isorank algorithm are also available. Gene-gene interactions for yeast, fly, worm, and human were considered. Check the checkbox on the right side of the navigation bar. calcEntropy.py This is a generic script to calculate entropy scores for a given set of values. For details on input file format, execute the script without any parameters to display help. The script was originally used to calculate mean normalized entropies for clusters of predicted orthologs. GO ids were provided for each protein or gene id in a given cluster. IsoRankN2.tgz IsoRankN2 executable and README. IsoRankN2 accepts and simultaneously aligns two unrelated sets of networks. Algorithm was used to integrate network alignments of genetic interactions (GI). Optional parameter includes a --beta flag which takes an argument from 0 to 1. A beta of 0.5 weights both sets of networks equally and a beta of 0.75 weights the first set of networks 3 times more than the second set of networks. We used IsoRank & IsoRankN on five eukaryotic PPI networks: H. sapiens (Human), M. musculus (Mouse), D. melanogaster (Fly), C. elegans (Worm), and S. cerevisiae (Yeast). Two forms of data were required as inputs, PPI networks and sequence similarity scores. The PPI networks were constructed by combining data from the DIP (06/14/2010), BioGRID (release 3.0.68, 08/31/2010), and HPRD (release 9, 04/13/2010) databases. In total, these five networks contained 87,737 proteins and 114,897 known interactions. The sequence similarity scores of pairs of proteins were the BLAST Bit-values of the sequences as retrieved from Ensembl. where pi is the fraction of S*v with GO group ID i. Thus a cluster has lower entropy if its GO annotations are more within-cluster consistent. We also measured the fraction of clusters which are exact, i.e. those in which all proteins have the same GO ID. With regards to choosing a set of proper GO annotations, we projected all GO terms to the same level of the GO heirarchy (k=5), removing questions of generality of terms and relatedness of annotations having different IDs. Note that only 60-70% of the proteins in any of the aligned networks have an assigned GO ID, comparable to the fraction of all known proteins included in GO. Additionally the relative performance of this consistency measure does not change when projecting GO terms to GO heirarchy levels of k=4, k=5, or k=6. *The fraction of predicted clusters which are exact, fraction of proteins in exact clusters. The number of GO/KEGG categories enriched by IsoRank & IsoRankN. *As computed by GO TermFinder, we remark that this excludes those proteins tagged IEA (inferred from electronic annotation). 1. How can I cite Isobase? 1. Rohit Singh, Jinbo Xu, and Bonnie Berger. (2008) Global alignment of multiple protein interaction networks with application to functional orthology detection, Proc. Natl. Acad. Sci. USA, 105:12763-12768. 2. Chung-Shou Liao, Kanghao Lu, Michael Baym, Rohit Singh, and Bonnie Berger. (2009) IsoRankN: Spectral methods for global alignment of multiple protein networks, Bioinformatics, 25:i253-i258. 3. Daniel Park, Rohit Singh, Michael Baym, Chung-Shou Liao, and Bonnie Berger. (2011) IsoBase: A Database of Functionally Related Proteins across PPI Networks, Nucleic Acids Research, 39:D295-D300. 2. What is the main difference between Isobase and other ortholog databases? Isobase has been developed by global network alignment on multiple PPI networks. We demonstrate that incorporating PPI network data in ortholog prediction results in improvements over existing sequence-only approaches and over predictions from local alignments. In addition, our network alignment tools outperform existing algorithms for global network alignment in coverage and consistency on multiple alignments of the five available eukaryotic PPI networks. 3. How does Isobase generate functionally related proteins across multiple species? We use the global PPI network alignment tools, IsoRank & IsoRankN, based on an idea similar to PageRank and graph spectral clustering, to detect and generate functionally related orthologs (isologs) for Isobase. We also evaluate the biological relevance of our predictions against two gene ontology databases: GO and KEGG. 4. What ortholog information is provided? 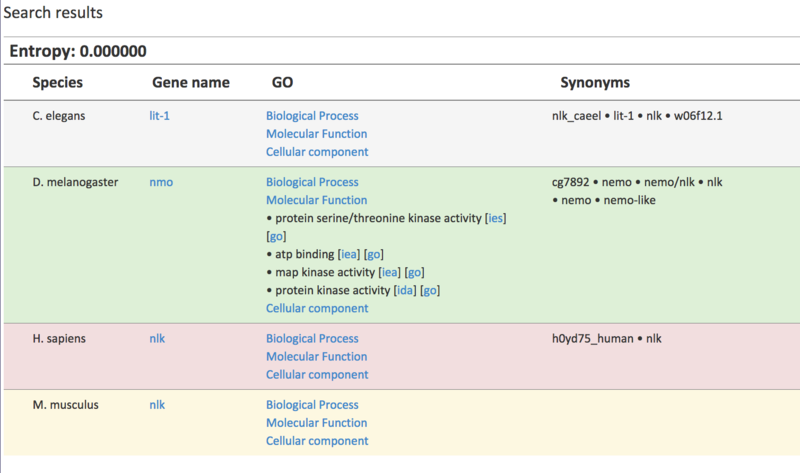 For each ortholog across multiple species, brief information such as constituent protein names and their respective synonyms, is provided. Moreover, we give the entropy of every ortholog/cluster to represent the consistency. That is, a cluster has lower entropy if its GO and KEGG annotations are more within-cluster consistent. The GO and KEGG categories the constituent proteins belong to are also shown. 5. Why does Isobase collect orthologs from only five Eukaryotic species? Isobase is a collection of functionally related orthologs (isologs) predicted by our network alignment tools. Hence we only provide the orthologs from five available eukaryotic PPI networks so far. The isologs across prokaryotic species (PPI networks) will be presented in the near future. With the increasing availability of large PPI networks, Isobase will collect orthologs from more species. To identify isologs of a specific gene, enter the gene id, symbol, or any synonynm/keyword. The Isorank executables support an option to include an additional unrelated network in the alignment. This additional network is simultaneously aligned with the sequence data and the PPI network. Genes with low coverage in the PPI network can be covered with an additional genetic interaction network. Isobase supports querying for isologs by multiple gene id types. Currently, supported ids include Wormbase, FlyBase, SGD (Saccharomyces Genome Database), HPRD (Human Protein Reference Database), MGI (Mouse Genome Informatics), gene names and gene symbols. The user can query for isologs by supplying a gene id, symbol, name, or any of it's synonyms. In this example, Isobase searches for the isolog(s) having id "CG4252".